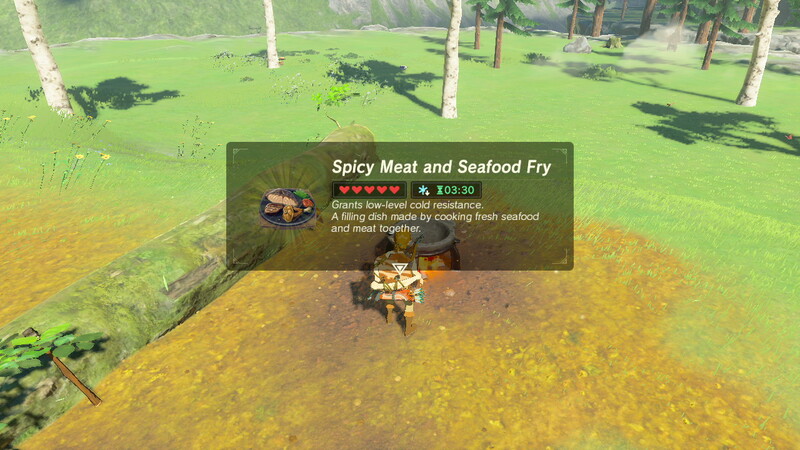 Breath of the Wild actually makes video game cooking interesting. On May 30th, the cult food publication Lucky Peach will be folding, their last issue rolling out to subscribers and mom and pop store’s bookshelves. And with it, a legacy of delectably designed, cheeky humored, lovingly illustrated features and recipes. Lucky Peach was a marvel of a food publication, founded by both journalists and chefs. It was the food magazine (and later website) for the low-key Pop-Up and Food Truck Generation. The destination for the best-looking stories about the meals we consume, and the culture surrounding them. Lucky Peach was loud, scribbling hand-lettered detail on covers or hardly anything at all. It turned blasé, tasteless food writing on its very head, and made food—both consuming it and reading about it—cool again. There’s a parallel on that with games, and how they influence each other naturally. Lately, games are signaling a new future of interaction in virtual kitchens, just as Lucky Peach once revitalized how we write and frame consumable feasts. An interaction with virtual food that’s a bit more experimental, just as chefs toy in the kitchen. I realized this as I was playing Breath of the Wild, a survival adventure game for the ages. In it, Link cooks. But there’s hardly guidelines for Link to follow, outside of a miscellaneous recipe or two. Link must feel out cooking for himself. He tosses in monster parts, meat, rock salt, plants, and other ingredients. His concoctions sometimes result in something edible. Sometimes it’s something very inedible. But at least he tried. And through it, we learn what meshes in this world, and what doesn’t. Breath of the Wild’s dance with cooking surprisingly errs on the side of actual cooking. Or at least, my experiences with it. Where you toss ingredients in a pot to see what works (but mostly, what doesn't work). By veering off the promised land of recipes, and going off the loose notes that your grandma wrote on a notecard when you asked her how she made that pasta that one time. Cooking has a process. But in most games, it's oversimplified and unimaginiative. Only step-by-step recipes paving the way. There have been some series in the past that implement cooking as a potential risk or reward, even if paved by recipe guides. Across most of the Tales of games, players gather ingredients from enemies and shops to craft meals. But it’s always a gamble, depending on the skill level required to make a specific meal. Messing up causes adverse effects rather than HP recovery and other tangential boosts (kinda like how messing up a meal in real life weighs a profound sense of disappointment in yourself). In Odin Sphere: Leifthrasir, in rest areas the player can hand ingredients over to their resident chef at Maury’s Touring Restaraunt, where the chef will grill up anything from egg on toast to french onion soup for the team. Food in games has always been tethered to the promise of health. Eat a tomato in Kirby, and you’re healthy again. Dine at a restaurant in Yakuza, and you feel better. For games like Monster Hunter and Skyrim, cooking is a way to prolong life across a long journey, an opportunity to store nourishments for the future. In Skyrim, the player already knows recipes that are cookable. In Monster Hunter, cooking itself is made into a mini-game as the player vows to not let their meat burn. But they’re relegated into pre-understood ventures: the art of cooking is already known and mastered, it’s just a matter of gathering ingredients or timing. Yet, there have always been cooking games in their niche. 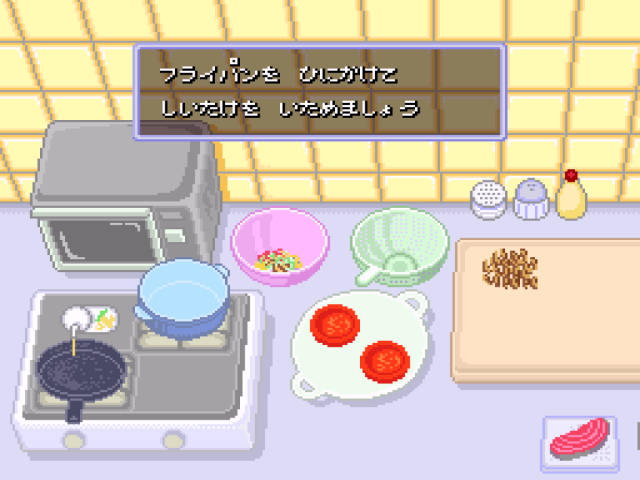 Or at least, some form of cooking in quieter games like Harvest Moon. Cooking Mama, a long-running series about the many layers of food prep, takes players through the long process of making a meal. From its DS origins in the early 2000s to a 3DS entry releasing this year, Cooking Mama has always put players in the seat of a casual chef with a cheerful mom cheering you on all along the way. The series was a rare insight into the process of making food—beyond just grilling meat on a timer. It showed the intricacies that come in crafting delectable meals, even if recipes wouldn’t particularly mirror what they are in reality. But before Cooking Mama, there was another game about food prep. 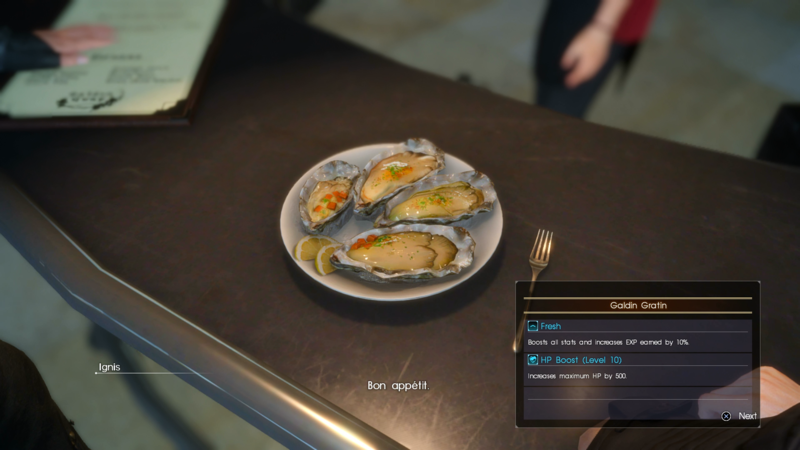 Final Fantasy XV, on the other hand, takes the player out of the shoes of the cook, and often feels like culinary art plagiarism. Noctis and the boys find themselves at a variety of highway-stranded diners along their long journey. They laugh, they eat food, and without fail, Ignis will steal a recipe. As if tasting the new food gives him an epiphany, he snaps his fingers in the air, and presto: at camp later that night, you’re having a repeat of that very meal. While it’s true, the most refined taste palettes can easily poke out the most minute of ingredients in a meal, there’s something downright unsavory about the idea of thieving recipes from little highway diners. Games have always lifted ideas from other games though, in that very Ignis-like way. Sometimes it’s something from an average or half-decent game that finds its way embedded into the weave of every game in a genre (like the typical Ubisoft tower popping up in every open world). Sometimes an idea is sworn by critics to be copied one day, such as the Nemesis system in Shadow of Mordor, but no developers step up to the plate. For food in games, cooking’s been forgotten outside of their niche, relegated to health and hardly anything beyond that. Until recently, as it’s crept up to the surface beyond a passing health boost. Lucky Peach was notable in the few years it was around because it seemed to influence a risky change in all the food publications around it. Bon Appetit adopted its cover style. More food publications took risks in their writing and design sensibilities overall. In a similar way, Buzzfeed's Tasty revitalized how video recipes of food are made. And now virtually every video bloggin' how-to cops its signature overhead style. I imagine for the experimental cooking that makes its way into future games, Breath of the Wild will serve as its signal. Or more so, Breath of the Wild’s going to change a lot about how developers approach open world games from here on out; such as doing away with objective plagued menus, opening the player to a seemingly infinite world to explore and even creatively cook their way through. That is until in the distant future, when semi-realistic, experimental cooking in games won't be such a wild idea anymore. Tagged with Analyses,	Cooking Mama,	harvest moon,	Little Motoko's Wonder Kitchen.